Elyx arrives today in the Republic of Niger, a Western African country located between Benin, Burkina Faso, Chad, Libya, Mali and Nigeria, with a population of 19 million. As always, somebody is looking forward to greeting the digital ambassador: UNICEF colleagues this time! They tell Elyx that unfortunately climate change impact is particularly harsh in Niger, where state of waterways is scarcer and scarcer. The ensuing cost on climate change-related challenges is estimated at 7.5 to 15 billion euros for the period between 2000 and 2008 alone. Elyx is shocked! 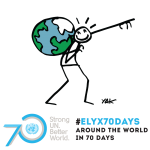 Elyx is delighted to see that UNICEF puts youngsters at the heart of the debate on climate change. Indeed, UNICEF thinks that they can be a powerful driver for change! By feeling the harsh impact of climate change on their communities’ livelihoods, they can raise awareness and promote a behavioural change. 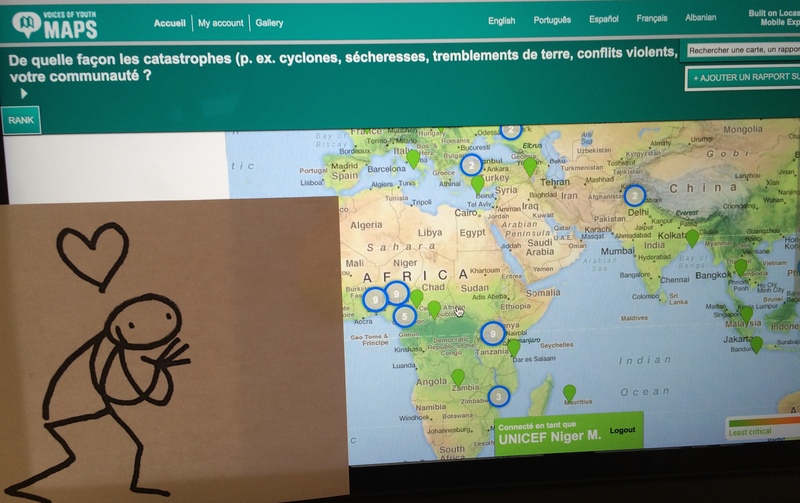 This is the idea behind the UNICEF project MAP4DEV: six youngsters between 23 and 29 have resorted to digital mapping apps to document the impact of climate change, investigate its causes and propose solutions. Their ultimate goal is to spur action and dialogue on the issue of sustainable development. These young people, together with teams from other 10 countries, will present their findings to the general public and decision-makers during the Conference of Youth, which will be held in Paris at the end of November alongside COP 21, the global summit on climate. UNICEF staff also explains to the UN digital ambassador that the country’s population, mostly rural, heavily relies on the country’s abundant natural resources. For example, did you know that Niger hosts some of the world’s largest uranium deposits? 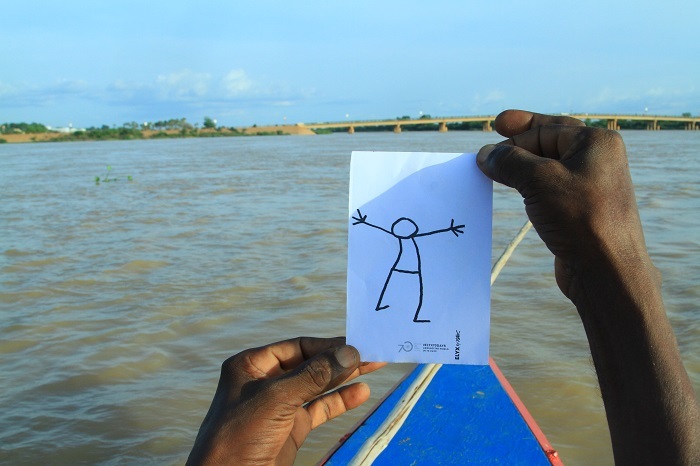 Elyx also learns that the Niger River, which crosses the main city Niamey, is not only wondrous, but also precious. Indeed, it provides water for the 1.5 million people living in the metropolis! The digital ambassador is saddened to hear that Niger is a very poor country economically, where chronic food insecurity is still a scourge affecting about 2.5 million people. However, the digital ambassador is delighted to learn that FAO is helping enormously rural families through quality seeds distribution. The digital ambassador also hears that the WFP teamed up with the government, national NGOs, microfinance institutions as well as FAO, IFAD, UNICEF and UN Women, to implement the Protracted Relief and Rehabilitation Operation (PRRO). This includes, among others, Food for Assets activities promoting land regeneration and water harvesting/irrigation activities to raise local production as well as Targeted Supplementary Feeding for malnourished children and pregnant/nursing mothers. 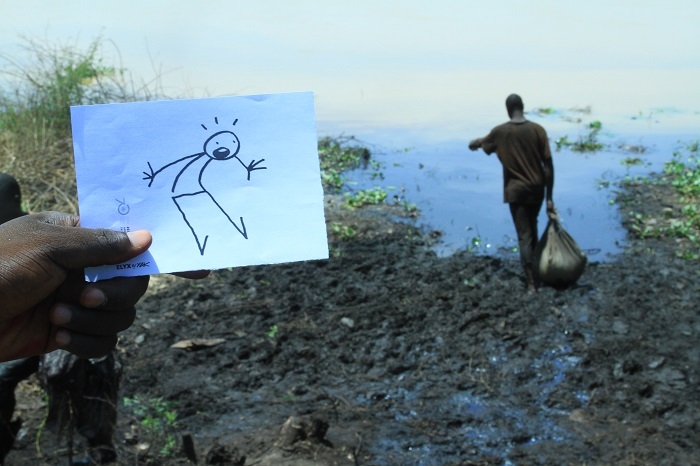 Elyx marvels at the Niger River which crosses the main city Niamey; offering inhabitants water and the resources they need. (Photo: UNICEF Niger). Along the way, Elyx cannot help but admire Niger’s breath-taking landscapes, such as the dunes surrounding the main city. However, the digital ambassador decides to be careful: as beautiful as they are, the dunes can also be very dangerous. As Elyx knows, strong winds and rains push sand into waterways, causing floods that threaten the population and block access to schools and medical centres. 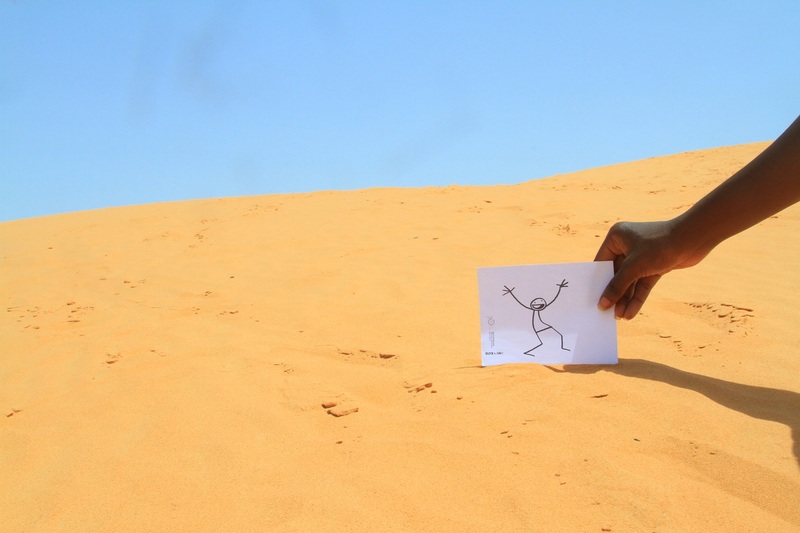 After an adventure-filled day, Elyx pauses to think: Niger certainly faces some challenges, not least climate change, but the UN digital ambassador leaves full of hope. After thanking the marvellous UNICEF team for its warm welcome, the UN digital ambassador promises to come back as soon as possible!